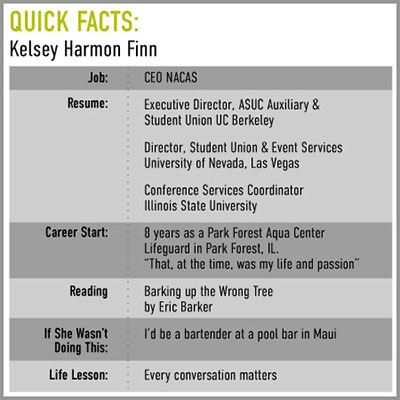 Kelsey Harmon Finn joined the National Association of College Auxiliary Services (NACAS) at a pivotal time both in the association’s history and as higher education began desperately looking for solutions to its many operational and economic woes. In her role as Chief Executive Officer, she believes the nearly 50-year-old auxiliary organization holds the keys to campus access, and ultimately, student success. On the eve of a major re-imagining initiative for NACAS, Finn shared her views with Barnes & Noble College on how she believes commerce and education can come together in a way to enrich the campus experience. 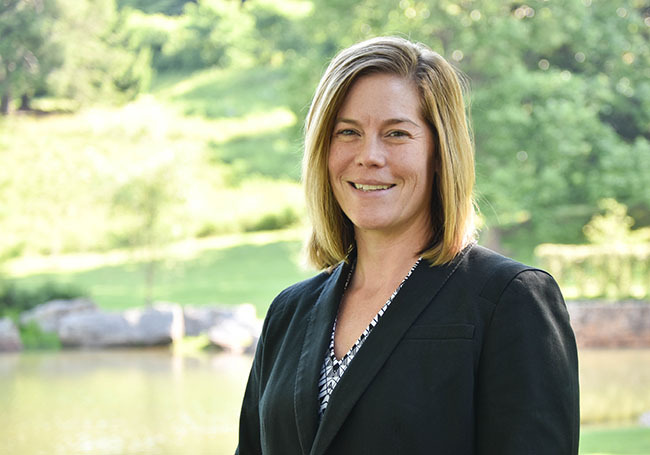 On paper, Kelsey Finn’s move to Charlottesville, Virginia, last year, to head NACAS, may have seemed curious, but in person, it becomes instantly understandable. Finn listens intently and responds thoughtfully, but with a pragmatic realism. And then there’s also a conspicuous generosity about her, softened by a fondness for using words like ‘folks’ that reaches back to her Midwestern roots. Having already carved a noteworthy resume in higher education and association management, it’s clear that not only does she care, but she also has the passion of someone who knows exactly where she should be at this point in her career — along with a remarkably clear-eyed understanding of the task ahead. In her previous role as Executive Director for the Auxiliary and Student Union at U.C. Berkeley, she managed a $20 million operating budget to oversee the university’s largest student-fee funded project: a $223 million student union complex. That gave her an appetite for doing bigger things. “At Berkeley, I understood the impact you can make on a campus and how that can really make a difference,” she explains, “and I realized that if I was to have the opportunity and honor to be CEO of NACAS, I could make that kind of impact globally, and truly affect the future of education,” she adds. But before she could ponder her new employer’s impressive reach into colleges and universities, both in North America and around the world, she first needed to modernize the image of the association. As the largest auxiliary services support organization serving higher education, the nearly 50-year-old National Association of College Auxiliary Services, had a solid reputation, but one in need of a makeover. “I think at the time I joined, NACAS was questioning what its purpose was in the association world, and I knew through our interaction with institution members and business partners that it would be an exciting challenge to bring them together in a way that would expand interest and access for business on campus,” she says. Key to that would be addressing membership, and providing NACAS with a bigger voice and a more valid platform. “People gravitate to folks who act like them and think like them, and when you can see yourself as part of an organization where you feel you’d fit in — feel welcome — then you’re going to join it,” she says. Not even two years later, she’s making her mark. Hiring a branding agency last year, Finn believes this month’s impressive launch of a new visual identity is going to go a long way toward helping to redefine NACAS and its proposition to the education marketplace. But what excites her more is the development of the association’s core brand messaging and the reaffirmation of its greater commitment to the higher education community. Some of the new initiatives will include an emerging professionals program, a revamped conference and regional event strategy (due to debut with the newly re-imagined November C3X Annual Conference and Expo), along with programs to develop conversations around issues such as greater diversity and inclusion — that will all support that mission. Perhaps the element of the new NACAS that most fiercely drives Finn is in the way she believes the organization could impact student success. “NACAS in the past has never commented on the impact on students, so we’ve intentionally changed our tagline to ‘enriching the campus experience,’” Finn says, “and I really believe that speaks to folks working in auxiliary services on campus and how they’re able to achieve that — whether they’re providing food or books or a parking space. There is a commonality in our membership in that they either have the direct ability or the influence to bring business and services to campus; they have business acumen, they think like business people and understand that coexistence between business and higher education can support academic success, help students navigate their time on campus better and assure the future of the campus because of the service or product they’re bringing to the table,” she explains. Finn also acknowledges that the future of the campus is already here. “What students love now is data and power,” she was quoted as saying recently. It’s an appropriate rallying call for how businesses can create the kinds of service and product offerings relevant to a new generation of students. “They want access to information, to tools, to resources 24/7, so if you can think about how you can provide food services or retailing that can deliver to the residences, or how you can work with multiple business partners to create different kinds of delivery platforms, or how you can make different use of space, then you’re beginning to think of the campus as a community,” she says. On the newly designed NACAS website, the first invitation that leaps out at you is the word ‘belong.’ Spend time with Finn and you’ll understand why anyone would want to belong to something she believes in quite this much.